It finally happened. 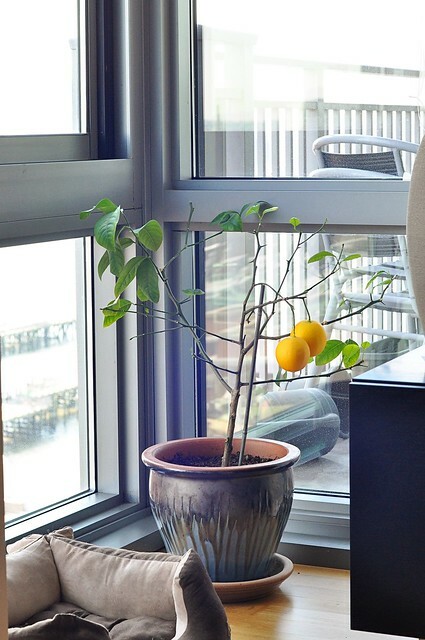 George, our Meyer lemon tree, produced real, honest-to-goodness lemons! When we last left off (nearly a year ago?! ), I had done my best to pollenate George’s flowers and we had three baby lemons that seemed to have stuck. They were small and hard and green. Slowly they began to grow. I remember taking note of the point where they were about the size of golfballs, still green. After that, it seemed as though they never grew any larger–until I’d cup one in my hand and realize it was beginning to fill my palm. And then, all of a sudden, they were baseball-sized and turning yellow. George’s lemons have actually been ready for a while now. Over a month. Maybe two even. All three of those little green nubbers did survive, and Chris and I harvested one a while back to squeeze into our evening tea. It was bright and tart. It had pith and seeds. It was a lemon. I didn’t expect it to be anything else, but it was still astonishing in a way because I helped to create it (George, of course, gets most of the credit). It’s been difficult for me to pick the others. I’ve used my wanting to write this post as an excuse to delay it, but the truth is that it’s hard to let go. They took so long to grow! I know they need to be picked, however, and I also know that George needs a break–just look at the state of his foliage! So today I’ve harvested the remaining two lemons. Hopefully he’ll recover some strength and gift us with a few more. In the meantime, I need to decide what to do with the ones I’ve got. What’s that saying again? When George gives you lemons…. … make lemon curd! Congratulations on three! 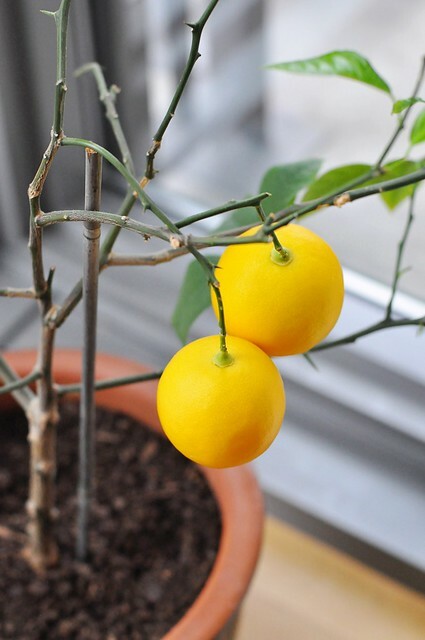 I was gifted with 3 Meyer lemons today and don’t know what to make, either… I don’t even know what they taste like which makes it harder for me to decide what to do… what did you end up making? It’s terrible, Janet–I still haven’t done anything with them! They’re in my fridge, staring at me every time I open it. I’ll probably wind up using them to dress a salad or something, unfortunately. Please come back and let me know what you do with yours, though!